People love pie. It is just a fact of life. Coconut Cream Pie is a total classic! With it being pie season and all, I figure it was high time I share the recipe that my family goes crazy over! In medium sauce pan, combine sugar and cornstarch. Add half and half and egg yolks and whisk until well combined. Bring to boil over medium heat, stirring constantly. Boil 1 minute and remove from heat. Stir in butter, coconut and vanilla. Pour into medium bowl, cover with saran wrap directly on the filling itself to avoiding a sticky film on top. Let sit for 30 minutes. Spoon coconut mixture into pie crust and careful speed to evenly distribute. Cover and refrigerate for 30 minutes or until set. Spread evenly over pie and sprinkle the top with toasted coconut. What kind of coconut do you use? Plain dried (dessicated) coconut flakes? Sweetened coconut flakes? Fresh grated coconut? Is there a season for pie?? I hope not because I love pie all 12 months of the year. I could eat a piece of your coconut cream pie right now. Maybe a slice and a half if nobody was looking. Homemade cream pies, like coconut or banana, are truly a delicacy and nothing like storebought and there's just no comparison. This looks and sounds....amazing! Pinned of course! Hi. 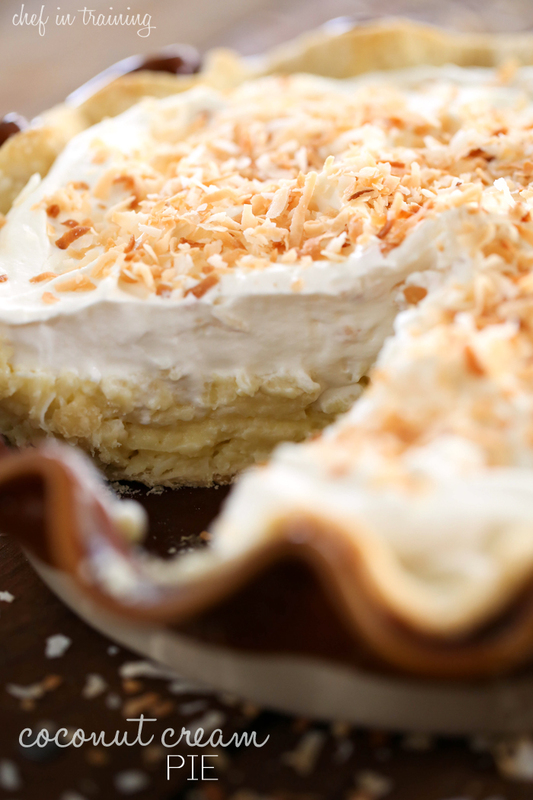 I love coconut and this pie looks delish. Could you please tell me what i can use instead of half and half. I live in England and i have not noticed such a product ay our supermarkets. Thank you. I use unsweetened coconut milk instead of half and half. More flavor. hello there, could you please advise what the half and half is also is a sweet pie base. We are from NZ so not sure if we have the half and half. The desert looks delicious. Thankyou. Can you use Splenda or Swerve for the sugar? WHAT IS HALF & HALF ????????????? its found next to the heavy cream. Its parts cream and milk. What for you mean by half & half used in the Coconut Cream Pie please. half and half is found at the grocery store. It is half cream and half milk. In the coconut cream pie recipe says 2 cups half and half . What is the 2 cups half and half of ?? half and half is found next to the heavy cream. It is half cream half milk. Why not use the egg white to make a meringue topping instead of the whipped topping? for those out you who don't know what Half and Half is it is found in the dairy sectional your local grocery store - that a what it is call "half and half" it's not a typo! for those of you who don't know "what type of coconut and what half and half is - you should NOT try to make this until you enter a grocery store and look around other that the pre made food sections!!! I saw this recipe on facebook and tried it. I have already made 4 pies. My neighbor asked for the recipe after they inhaled the pie. I took 2 more today to a birthday party and everyone raved about it as I knew they would. 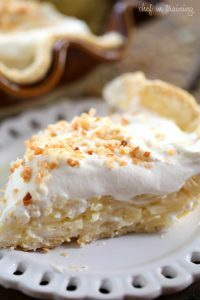 This is the best coconut cream pie that I have ever tasted!!! And that is exactly what people said at the party too. AWESOME!!! Thanks so much for sharing this recipe. what kind of coconut do you use? It clearly says shredded coconut! Fallowed recipe....pie didn't set completely?? Any suggestions? I made this pie a couple weeks ago. There are no words! Heavenly! Everyone loved it! Loved this recipe! Can't wait to give it a whirl! If you really want to kick it up a notch and make this pie unforgettable, try sauteing the coconut in butter till it's golden brown before adding it to the filling mix. Be sure to save some for top also instead of the toasted coconut. I can almost guarantee you will never go back to "raw" coconut pie again. I LOVE coconut. Going to enjoy making and EATING this. I notice lots of questions about half and half. This is single cream In the UK . What is Half and half in the coconut cream pie?? I finally made this pie. I love this pie it is my all time favorite and I have always wanted to make one but was timidated by it. This recipe was super easy and I did it!!! YAY me! Please visit my blog for picture. Thanks for all the yummy recipes you post. I just made this for our Thanksgiving Dinner today! When I licked the bowl (yum! ), I noticed that I wish it had a little bit more coconut flavor. I think next time I will add a little coconut flavoring when I add the vanilla. I know it is in the whipped cream topping too, but you can never have too much coconut flavor! :-) Thanks for the recipe! I followed the recipe just like it is listed and this was amazing! I am making my second one tonight. Thanks for sharing the recipe! Looks delish! Can we get the recipe for the pie crust used in the photo, please?